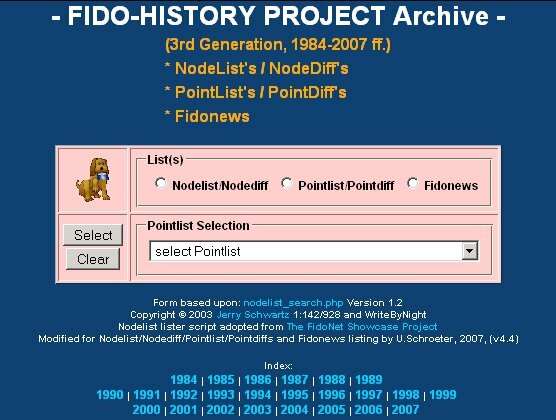 [28.4.2007] On doing some recovery of single files or parts of the Fido-History-Project archive, i'd running into a problem were 2 full lists exists with all except 1 diffs in sequence. In 1993 Region 24 has been reorganized in Nodelist #173/1993. The changes hasn't been reflected in the Region Pointlist from beginning, so the distribution with the new structure starts after a few weeks. In the meanwhile R24 has became a split into R24 Classic (the group that patched the official Nodelist with the Classic R24 structure before #173/1993) and R24 Light. Also the Pointlist has became a split into a R24 Classic distribution and a R24 Light distribution. As of system crashes, defective tapes, lost floppys, the archive of old R24 Pointlists was reduced to about 6 Pointlists after #173/1993, and again subsequent R24 Pointlists starting #049/1994. Between the #351 and #365/1993 and #049/1994 List there are subsequent Pr24Diffs starting #007/1994 available. So it comes to an idea, to reverse engineer the DIFF processing backwards from Points24.049/1994 back to Points24.365/1993 and fill the difference with the information from Points24.351/1993. Assumption: i have a source FTN List and a FTN Diff file. D1 Delete 1 (reverse: Add 1) => ? COPY works for the DIFF in both directions. An ADD command means, that a record in the old list doesn't exist and a new record will be inserted into the newer List. From the view of the new list, this record doesn't exist before. So the ADD command works as a DELETE command in reverse direction. The delete command becomes in reverse mode an Add command. A record that exists before, has to be deleted. In reverse engineering this record has to be rebuild. As i don't know the content, that has been deleted before, i'm using a placeholder. If i have a list one prior (#007) before the list that have to be recovered (#014), i can compare the older list (#007) record by record with the recovered list (#014) and can replace each placeholder with the content that relates in the older list (#007). If a record is added to the recoverable list and has been deleted later in the diff sequence that is used to get the recoverable list, no infos about the original content of that line exists (not in list prior to the recoverable list, not in the diffs, nor in the starting list for recovery). Such a problem also occure if a record has been deleted and re-added (applying changes with later delete in the diff sequence). All such problems can be detected by the CRC check, but this prevents to successfuly recover the list. Content ,1,Point1,.. ,1,Sysop,.. ,1,Sysop,.. ,1,CoSysop,.. ,1,CoSysop,.. ,1,CoSysop,..
? ? D1 -> ? But, one list before, Points24.035 results in an error. There are 40 possible mismatches of Bossnode segments with 1 to 70 mismatches of Pointlistings each. Lines that has been replaced or removed are such possible mismatches. so these lines becomes to be no longer possible mismatches. By visible compare and check i can exclude the first seven Bossnode segments of seven checked segments from the mismatch table, because their lines are referenced in one of the DIFFs #007-042. Checking step by step each referenced entry reduces the possible mitmatch lines, that can be possibly fixed in a later step to get a correct CRC value for Points24.035. One note: Sources of Net 244 Bossnode Pointlist Segments sent for Points24.365 helps me, to find some correct lines listings. Other mismatches, i have to figure out.